We have all been there as mothers. The need for just 5 minutes of sanity before we return to tend to our child who demands our undivided attention pretty much every second of the day. Who Wants a Mommy with a Moustache? is a pocket-sized book of rhyming conversations between a modern new mom trying to balance out the unexpected daily trials and tribulations of motherhood–professional and social obligations being the least of them – and her havoc-wreaking infant. Created by two first time mothers, Dalia Menhall Mirza and Maya Majdalani, this book is sure to make you giggle at the accuracy of motherhood captured. It was an especially refreshing read for me because of course all the bed time stories I read to Baby Z are understandably directed towards his age group, but Who Wants a Mommy with a Moustache? is solely addressed to us mums, yet designed in a child like manner. This means that I can read this book as part of our bedtime routine, whilst enjoying a laugh at the same time. so mommy can look like herself once more. 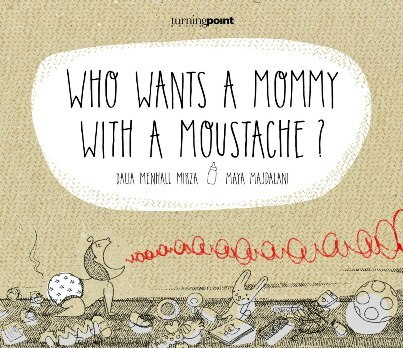 The latest in Turning Point’s series of bilingual books, Who Wants a Mommy with a Moustache? speaks to the new generation of mothers in the Middle East, but is relatable to every mother on this planet. It’s a great way to also read the same narration to your child both in English and Arabic, if like me you are hoping to make your child bilingual…or even multilingual! I must also mention that the details in the illustrations are pure genius. Excuse me whilst I giggle over the accuracy of the excellently drawn doodles. Every mother out there is successfully navigating their way to being multitasking monoliths, taking each hurdle in style. It’s far from an easy task, and Dalia and Maya have crafted a hilarious account of everyday moments to help mothers know that they are far from alone on this roller-coaster ride. If you are interested in grabbing your own copy, pop in to Book Munch in Dubai to purchase the book that is sure to make you LOL. Alternatively, you can order online via Amazon (click here) or Antoine (click here). Note: This book was kindly sent to me by the publisher for review, however all opinions expressed above are honest and solely my own. Yes, it really is a good read! Thanks for stopping by!